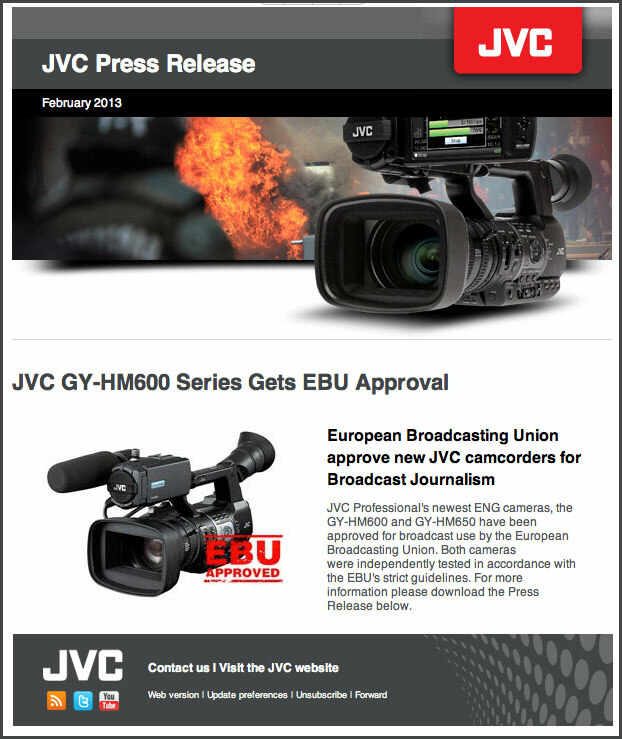 London, February 2013 – JVC Professional Europe Ltd. is pleased to announce that both the recently released GY-HM600 ProHD and network enabled GY-HM650 camcorders are now fully EBU approved for broadcast use. These two new JVC ProHD cameras have been designed specifically to be in line with European Broadcasting Union (EBU) guidelines for broadcast use. The EBU recommendations are designed to provide a common set of performance standards for broadcast production across Europe. Cameras are independently tested and approved by the EBU. JVC’s GY-HM600 series cameras (GY-HM600 and GY-HM650) are now fully approved for journalism use (“Tier 2J”). The cameras are also approved for general long form HD programming (“Tier 2L”), when used with a suitable external recording device supporting 50MB/s or greater recording. The testing of the GY-HM600 and GY-HM650 cameras was carried out by Alan Roberts in accordance with the EBU guidelines. I must say this, i can not wait anymore. JVC camera is the most reviewed camera on “Planet”. I have been reading all of your 650 reviews. Great job. I have recently droped into a shop here in Switzerland, the only complain they had about the JVC 650 was the loud fan. A mic will pick it up. So now JVC offers CHF 300.00 to any mic with an extension away from the camera. Have you had any issues with that too? I must say, testing the camera in the shop I have noticed the fan too. HDW : I was not aware of the fan noise let alone a fan…the Canon C300 has a fan I do notice but the HM600…not an issue. Remember as a professional you hardly use the on board mic and certainly not for serious sound like interviews ! Ah – one of the benefits of living in a cool climate: no fan noise! HDW : Not the case, without the fan the electronics would fry. JVC GY-HM600E fan problem. After a lot of research I bought one in Aug 2013. None of the JVC promotional information mentioned a (cooling) fan. I used the camera for 18 hours over a 10 day period to record video and natural sound audio while on safari in Zimbabwe. This involved trekking for hours each day in 45 degree (C) heat in difficult bush conditions, with a professional guide, tracking elephant, lion, wild dog, etc. Operational constraints meant it wasn’t possible to review footage in detail during the trip. On the flight back and during subsequent editing I found that almost every clip had a background rumble from the fan (as well as loss of focus issues). I returned the camera to the supplier who wanted the opportunity to ‘fix’ the problems. The supplier replaced the fan but the fan noise problem still remains. I recorded using both the internal and an external shotgun mic. Fab ‘rumble’ was recorded in almost every situation – effectively ruining all the footage for a website video. Most of the footage was shot in ‘run & gun’ mode, handheld, often lying on the ground with a 6 tonne bull elephant standing over me. JVC makes scant reference to the fan but this little component can have a big impact on your output. I am returning the camera as ‘unfit for purpose’ and will look for one without a fan. It’s a pity because the lens focal range and general features should make it a very good product for my needs – but not the fan. Video quality is good in good light but (auto) focus speed stability is a problem at dawn and dusk when light levels are lower.